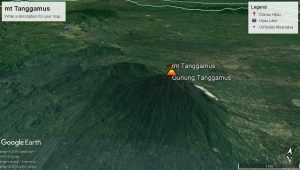 Regional geology of Kota Agung and its surrounding areas, Tanggamus district is dominated by young volcanic (HolocenePleistosen) such as breccia, lava and tuffa. In Hulusimpang formation (miocene Oligosene) consists of volcanic and lava breccia. Old rocks are found in the complex Mount Kasih with the metamorphic sequence from low to medium in the area northeast of young volcanic. Surface geology in the research area is dominated by volcanic products terrier or volcanic tertiary or called Tanggamus volcanic. Alluvium and altration rocks are in the southwest of the study area. Many layers are heated but the altration layer of the geothermal system is in the middle The research area is close to the Pagaralam area on the Ulubelu caldera. With direction trend from north to south and southwest, parallel to Belu river and river Ngarip. Mount Sulah, mt Kukusan and mt Duduk are composed of andesitic, basaltic and volcanic dacit during the Pliocene period. The mountains are located in the middle of the research area with volcanic products heading west and southwest (Suharno, 2000). Lava from Mount Sulah is under the lava of Mount Steam and cover of the rindoklastik Mount Rindingan on its graben structure. Mount Sitting right in the center of the Ulubelu caldera, is a dome covered by Piroklastic mt Rindingan. Mt Kebawok, Mount Tanggamus, Mount Rindingan and Mt Korupan are mountains during the Pleistocene volcanic period in the southeast, east, north and sea ​​turtles surround the research area.